Actually these are done using services in ANDROID. These are called BroadcastReceivers.Your class has to extend the BroadcastReceiver class to get these broadcast events. But note that these services need to have an interface. So you will not see any UI on the device. But don’t think your application is not running or not installed. Look at the console for results. You will probably see this type of console on running this application. This means that your service has been installed in the emulator. Check the apps installed. You will probably see your application. 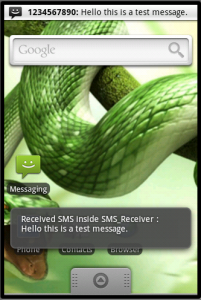 Now we are going to create this SMS receiver application. Create a new project and copy this code to the java file created. No XML file for layout is used here. Note that every receiver should be registered in the manifest file in order to receive intents using the receiver tag. Take a look at this code. After sending the SMS mentioned in one of the methods after running this application, quickly switch to the emulator to see the output, because I am using a toast to display the message, So it will come and go and you may not see. 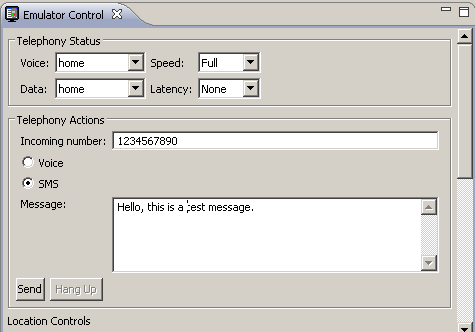 Sending SMS using emulator control. Please leave your comments if you found this post useful. I appreciate you guidance as early as possible..